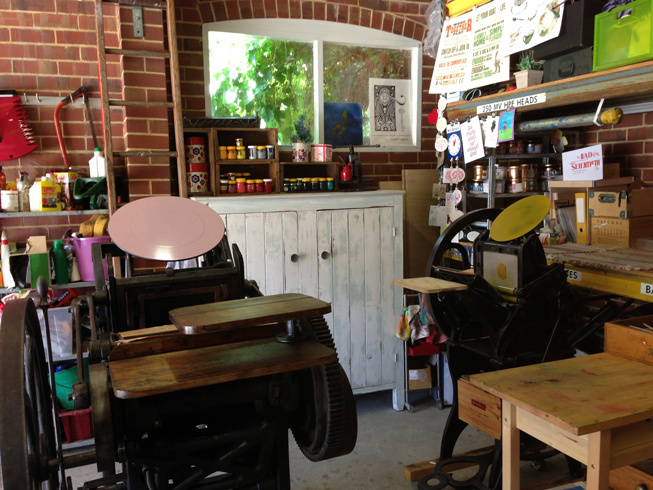 My Name is Davina and I’m a letterpress printer. I have been the designer and printer at Fluid Ink Fine Letterpress of Australia for 4 years. I have also operated Mini Ink Custom Cards for Kids and Mini Ink Fingerprints for 7 years. I’m a mum, a wife and a singer with WASO. 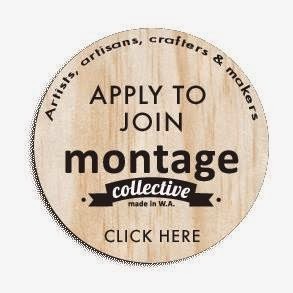 To my absolute delight, I joined Montage in September 2012. Being involved with a group of like-minded crafters has given me inspiration and a community to call home. I love being in a store that I can call ‘mine’. I get a chance to chat to customers as well as hang out and learn from fellow Montage makers. I really enjoy that we work towards a common purpose of sharing the love of products that are designed and hand made right here in Perth Western Australia. I print letterpress coasters, greeting cards, gift tags, invitations and wedding stationery onto 100% cotton paper and recycled card stock using photopolymer plates, vintage illustrated blocks and moveable wood & metal type. Fluid Ink was born out of my urge to 'unplug' from my regular desk job in front of the computer. Working with letterpress forces me to be slow, accurate, work only with what equipment and tools I have and there is no 'undo' button! It’s a dinosaur’s approach, to be sure, born out of nostalgia and a desire to unplug from my overly digitized existence. The appeal is being hands on, messy and sometimes quite physical. I print on an 1892 Chandler and Price Old Style (the main work horse 'The Admiral') and an 1893 Golding Pearl Old style #3 (the precious little lady 'Mavis'). It’s important to me that my work is seen and liked. I like to create pieces that are contemporary, current and fashionable. Its not art for arts sake, my letterpress items are meant to be used as purposeful stationery and paper goods. My favorite items are the conversational coasters. I love it when customers pick up or point and laugh at the humor in one of my prints or read the questions on the coasters out to one another in store. Staying connected on Facebook, blogs, following other like minded makers, joining forums and online teams have all helped me grow and appreciate what an enormous network of generous makers we have at our disposal. Sure, being 'un-plugged' is one of the things that appeals to me with letterpress printing but staying connected to real life people is my bloodline and its how I drive my business forward. Letterpress is the graphic design equivalent of slow food - incredibly labour intensive and demanding of skill and patience. When you discover a letterpress piece, there’s something different about it. It was touched by human hands, it is tactile, you can see and feel the indentation the letters and ink leave in the paper and you will fall in love with its quality, and if you do, drop me a line, I love printing bespoke requests and custom wedding invitations.